If you have ever had to compare information in one part of a Word document to another part of the same document, you will know it is tedious and awkward. Word’s Split button is the solution to this! A “Split” line displays across the document, splitting the document into two viewing windows. To adjust the part of the document you see in each window of the split view – position your mouse over that window and scroll the document up and down using the Scroll wheel on your mouse. Display in the viewing window the parts of the document you wish to compare. Drag the Split line up and down with your mouse to adjust each window’s viewing space. To remove the split, press Ctl+Alt+S again. Was this tip helpful to you? Anything else you want to know? Alan Leckie, above left, gave the following speech before the planting. My name is Alan Leckie and Scion, my employer has gifted this tree to the University of Canterbury. Scion, once known as the New Zealand Forest Research Institute, has been on campus since 1976. A pine cone was collected from the Lone Pine on the Gallipoli Peninsula by Sgt Keith McDowell of The Australian Army in 1915. This tree is Pinus brutia, or Turkish Red Pine and now has another common name – The Gallipoli Pine. It is a common tree that is native to Greece through to Iran/Pakistan. Seeds from the original tree were planted in Victoria, Australia and a cone was brought back to NZ from Australia and seeds were planted in Paeroa where this tree was propagated from. Scion has gifted about 50 trees to New Zealand and today on the 100th anniversary of Anzac Day, these trees will become the most important trees in our history in terms of remembrance & nationhood every Anzac Day. Memorials are very important to society because they continually refresh our memories. This memorial tree honours all those women and men who left our shores and it specifically honours women and men from this university. Over the 18 months I have been involved with these trees I have made a new friend in Turkey. Prof Melih Boydak and I have been discussing where NZ and Turkey fit together in today’s world. We both agree that we are now close friends; 100 years ago on this day, however, we were not and Melih has asked that I quote a statement of the great Turkish leader, Mustafa Kemal Ataturk. My parents collectively set aside 18 years between 1939 and 1947. My father as a soldier in Z Special Unit in NZ, Aust, Borneo & in J Force in Japan and my mother in the diplomatic corp in Ottawa, then to the Canadian embassies in Washington & Tokyo. 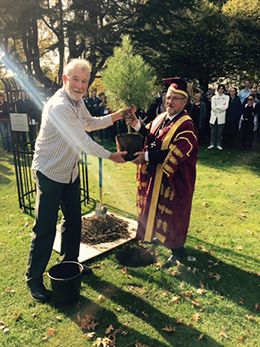 They were lost years in their lives, but they gave unselfishly for the benefit of us all just as the students and staff of the University of Canterbury did who we honour today with this tree. This tree personally for me is very important and I will always visit it. It gives me a memory. I trust it will provide the same for the University of Canterbury as you remember Anzac Day every April the 25th. 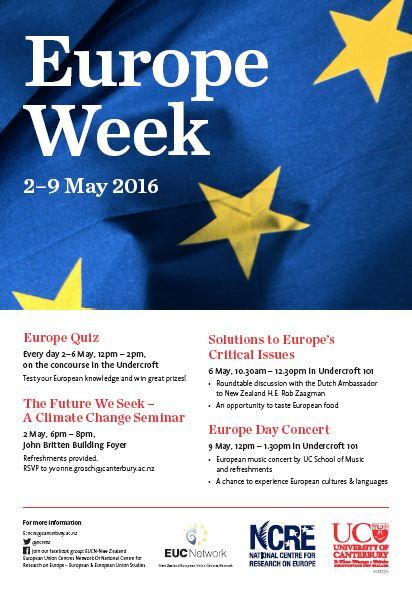 Europe Week Launches at UC! Prizes Galore! A Climate Change Student Initiative! A Concert by the UC School of Music! These are just a few of the activities UC Staff and Students are invited to participate in to join the 2016 Europe Week celebrations here at UC, 2-9 May 2016. Europe Day is celebrated annually on 9 May, a date chosen to mark the anniversary of the historic “Schuman Declaration” – Schuman’s proposal is considered to be the beginning of what is now the European Union. The NCRE traditionally take this opportunity to highlight the strong ties the University of Canterbury has with Europe through a variety of academic and cultural events – 2015’s celebration was officiated by the European Union Delegation to New Zealand at the official New Zealand Celebration of Europe Day. The 2016 celebrations at UC combine a number of different activities next week, including seminars, cultural events, an interactive quiz and the chance to taste some European Food. 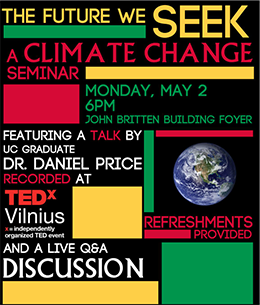 One of the events the NCRE is particularly proud of is the initiative of two NCRE PhD candidates who have organized a public seminar “The Future We Seek : A climate change seminar” featuring a TEDx Talk by UC Graduate Dr Daniel Price followed by a live Q&A discussion – this even is to be held on May 2, 6pm in the John Britten Building Foyer and all are welcome to attend! We look forward to you all joining in with our celebration . 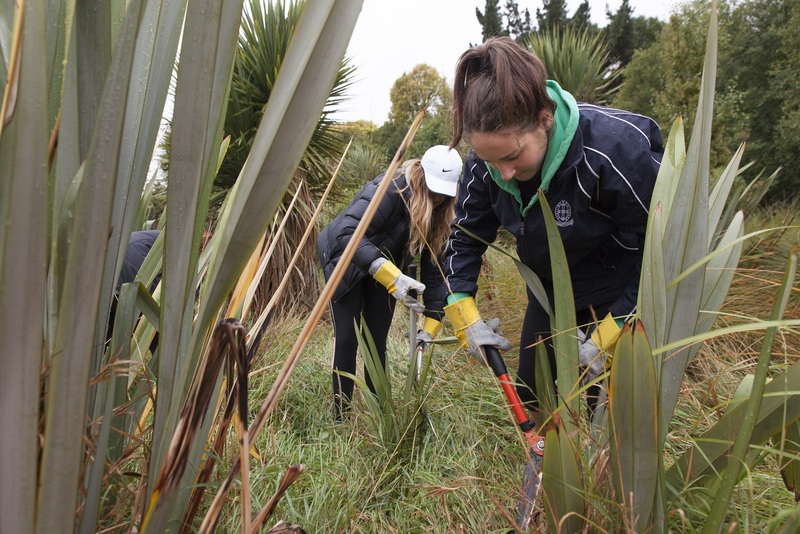 An area of wetland damaged by fire in 2014 was restored to its former glory with help from secondary school students and the University of Canterbury Student Volunteer Army (SVA). In 2014, vandals drove a car into Halswell Quarry destroying an area of native planting before setting fire to a section of boardwalk. 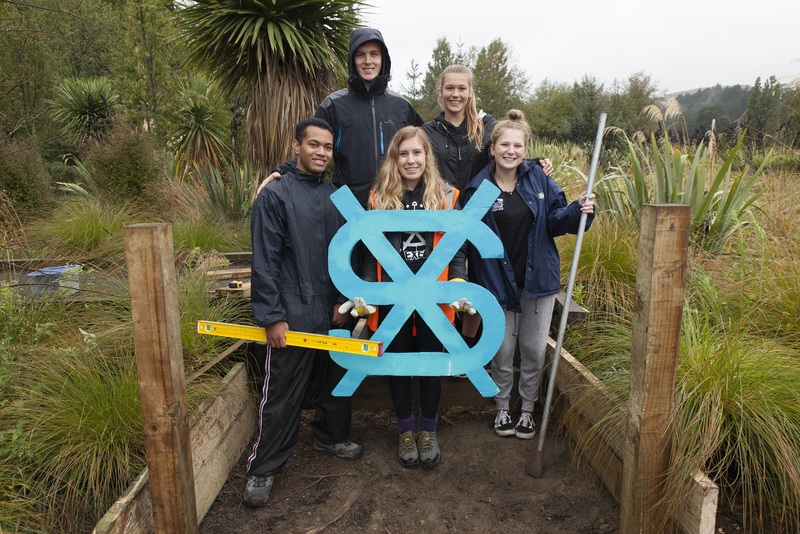 Recently, students from 10 Christchurch secondary schools, alongside the UC SVA, took on the restoration project as part of the SVA’s UCan volunteer programme and, in the space of a few hours, transformed the wetland area. The UCan programme encourages local secondary students to become leaders in their communities through volunteering, while being mentored by SVA members. Despite a rainy day, around 35 Year 12 and 13 students arrived eager to get to work. One crew set about rebuilding the damaged boardwalk, another group cleared the area around young native plantings and another used bark mulch to restore the pathway. 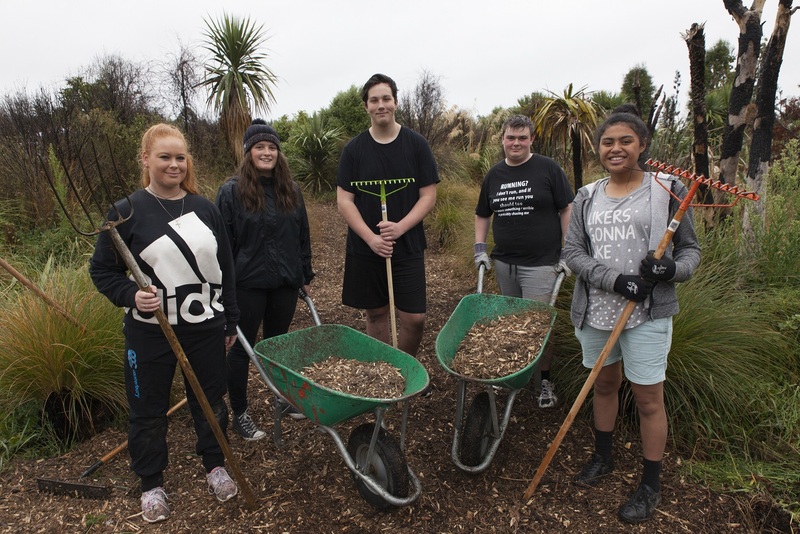 Christchurch City Council park rangers Nigel Morritt and Robbie Hewson worked alongside the volunteers. “It was an amazing effort. In the space of a few hours the volunteers transformed the area. With the boardwalk repaired, track mulched and native plants released, all traces of the fire were gone. The students were full of energy and enthusiasm for the project and were a credit to their schools and the organisation, ” Nigel Morritt says. We want you to come to our Communication Skills course, Tuesday 24 May 2016, and don’t miss out on Chairing Effective Meetings, Wednesday 25 May 2016. Come and explore your communication style and that of your team. You will learn how to build a supportive and positive communication climate and leave armed with techniques to resolve conflict – and that’s just the beginning!! Find out more information here, or click here for a registration form. You will leave this course with the skills and confidence to ensure you maximise outputs and leave meetings with action points.